Why did you decide to attend UMBC? And why did you choose your program in particular? 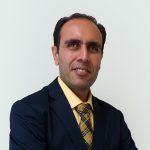 As an international legally blind student who had work experience for about 7 years after my first graduate study in Iran, I became interested in the field of accessibility research for individuals who are blind. HCC program in IS department at UMBC has great faculty members with expertise on accessibility research particularly for the blind community. Have you worked on any specific research projects (including any opportunity to publish or present your research) that you would like to highlight? In the past three years of my graduate studies, I have been involved in three major research projects all of which relate to accessibility research for the individuals who are blind. The first project relates to situational induced impairments and disabilities experienced by individuals who are blind while on the go (published as a full paper in Web for All, W4A 2016 conference. The second project relates to examining web credibility assessment process by individuals who are blind (published as a full paper in ASSETS 2016 conference). The third team project relates to examining the design of an ultra-mobile wearable navigation aid for individuals who are blind, using computer vision. Currently, the results of one of our studies in this team have been published as one poster in ASSETS 2016 conference and one full paper in CHI 2017 conference. When you’re not teaching and researching, what are your hobbies and interests? My hobbies are listening to music of different cultures in addition to classical Persian music. I also like to listen to audio books. swimming and walking outdoors is what I am excited about to keep me healthy.